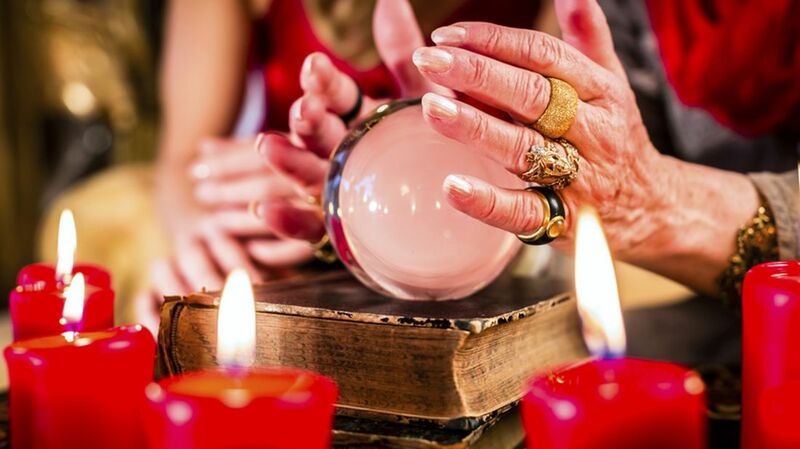 When you think of fortune telling, a few classic pop culture props come to mind: candles, tarot cards, sartorial mainstays like a turban, silks, or bangles, elaborate tapestries, and of course, the crystal ball. 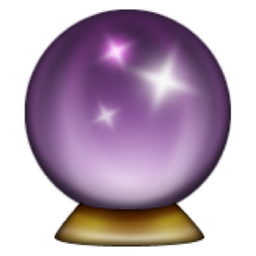 If you’re not a divination expert, you might not know that what one does with a crystal ball is known as scrying—a world derived from descry, which means to perceive. While the fortune-telling act is based primarily on staring into reflective surfaces like mirrors, stones, and pools of liquid, you can technically scry into pretty much anything. The practice has been around for thousands of years, making appearances in the mystical and religious traditions of numerous ancient civilizations (perhaps most notably the Druids)—as has the sparkling glass ball we've come to associate with it. Druids were a class of educated, highly respected citizens who lived in the British Isles and France during the Iron Age; they practiced a wide range of disciplines including poetry, lawmaking, medicine, and religious rites. While the Druids were largely wiped out with the spread of Christianity in the following centuries, witness accounts by notable Romans such as Julius Caesar and Pliny the Elder gave us some account of their religious practices. Pliny in particular devoted one chapter of The Natural History to “The Druids of the Gallic Provinces.” And in the very next chapter, he describes (and dismisses) various forms of magic, although not necessarily of Druids. These include “with water” and “with balls,” which might be early accounts of scrying. As Christianity continued to dominate Western Europe throughout the Middle Ages, scrying became a divisive practice. Some devout Christians saw it as vehicle for divine intervention, and claimed to have caught glimpses of angels in their gazing, while others saw the practice as blasphemous at best, and a portal for demonic spirits at worst. In his fifth-century book The City of God, St. Augustine denounced scrying, claiming all such mystic practices as “entangled in the deceptive rites of demons who masquerade under the names of angels.” The practice, however, would soon find an unlikely defender in the scholars and academics of the Renaissance. As Mark Pendergrast explains in Mirror Mirror: A History of the Human Love Affair with Reflection, the Renaissance brought with it an increasing popularity of translated Arabic writings. Along with many important scientific ideas, these translations yielded the works of Picatrix (a name given to both the translation and purported author), who saw mysticism as a branch of science. In elevating the practice of scrying to something noble and rational, these beliefs offered a welcome alternative to the gloom and guilt of Christianity, and scrying grew in popularity and regard among the educated elite, soon establishing itself as a scientific—or at least quasi-scientific—staple among burgeoning academics. According to the Museum of the History of Science, which boasts a 17th century crystal ball in its collection: “The literature of magic itself recalls a time when natural and supernatural knowledge shared a common language. Sixteenth-century records of séances at which spirits were conjured typically went under the title of ‘Books of Experiments.’"
The crystal ball continued to be stigmatized by the church, but remained in relatively good standing in the scientific world, eventually finding its way into the royal English court. Its introduction was thanks to John Dee, an alchemist and mathematician with a deep interest in the mystical. Dee was a close advisor to Queen Elizabeth I, and she relied on his counsel in the scheduling of important events and matters of astrology, among other things. Along with his partner Edward Kelley (who was reportedly a much more successful medium, though some believe he was duping Dee all along), Dee would hold regular scrying sessions that involved he and Kelley staring into an obsidian mirror in the hopes of communicating with angels to gain otherworldly wisdom. Dee wasn’t the only crystal-gazer to dabble in the political world; a few centuries later, Jeane Dixon garnered fame for her political predictions, which she made throughout the '40s, '50s, and '60s with the help of her trusty crystal ball. Dixon is best known for predicting the assassination of John F. Kennedy, though the legitimacy of her predictions is doubted by many. Her numerous skeptics coined the term “The Jeane Dixon effect” to describe the phenomenon of psychics being remembered favorably despite a scant number of accurate predictions, and a slew of inaccuracies. Dixon certainly had her share of inaccurate predictions: that Russia would be the first country to put a man on the moon (nope), and that George H.W. Bush would easily triumph over Bill Clinton (sorry, George). Even her famously accurate prediction of JFK’s death seems less-than-legit when you consider the vagueness of the actual “vision.” The item that ran in the Sunday newspaper supplement Parade, on May 13, 1956, read: “As for the 1960 election Mrs. Dixon thinks it will be dominated by labor and won by a Democrat. But he will be assassinated or die in office 'though not necessarily in his first term.’” On top of that, Dixon also predicted that Kennedy would lose the 1960 election. The popular image of the crystal ball reader—turban-clad and hunched over the ball—made its way into the mainstream partially thanks to the Roma or Romani people (often referred to as “gypsies” in the English-speaking world), who practiced various divination techniques and would sometimes set up fortune-telling booths at stops along their travels. Still, their clairvoyant displays were less about showcasing exceptional psychic talent and more about practicality: the booths were portable and easy enough to tote around as the community escaped persecution. 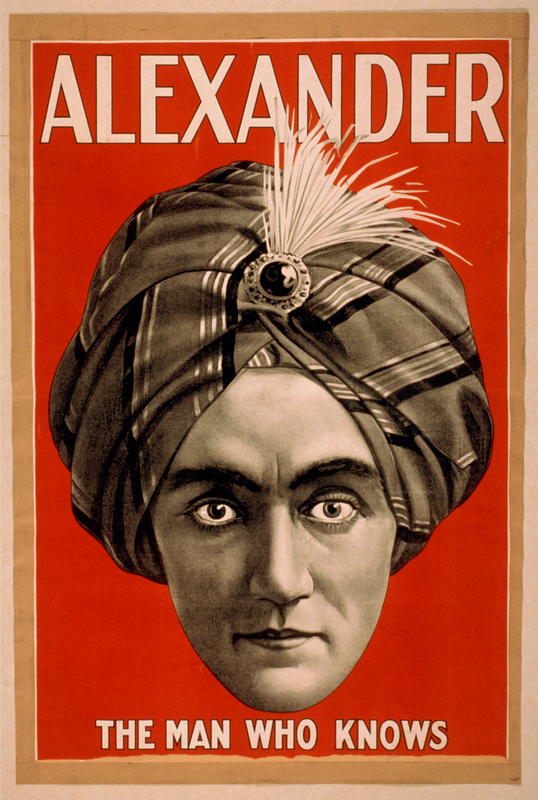 As for the turban itself, its origins almost certainly lie directly in the persona of one performer: Claude Alexander Conlin, who went by the stage name Alexander, The Man Who Knows. Alexander was a stage mentalist who, with the help of a crystal ball, would make incredible predictions about his audience members. Though he was extremely popular, Alexander was also a master marketer who made millions selling his own merchandise, including crystal balls. It’s likely this commitment to marketing we have to thank for the turbaned, bejeweled image of the male fortune teller, as you can guess from his striking (and well-circulated) posters. Since then, the Alexander-esque image has become a widely popular way to depict fortune tellers in movies, from Big’s (1988) Zoltar to Professor Marvel in The Wizard of Oz (1939). As a result, while most people in the modern world rarely (if ever) encounter the object itself, the icon is in many ways as prevalent as ever. After all, there's even an emoji of it.